That was one HECK of a show. We are overwhelmed with appreciation for the spectacular day on Sunday. This year, our fourth, we showcased just under 200 makers and hosted 7,000 people on the combined venue of Park Day School and Studio One Art Center. The weather was spectacular, the depth and variety of content superlative, the community feeling strong. And we had the first-ever, full-scale crate stacking show very likely in the history of the planet! Thanks go first to our makers, those creative, generous people. There is no Maker Faire without you. You are problem-solvers and you are by and large easy. You collaborate. You are curious and happy. Thank you for sharing your talent and your process and your prowess. Then there’s our partners—Studio One Art Center, a fantastic arts facility owned and operated by the City of Oakland—and MAKE magazine, the entity behind Maker Faire. And our sponsors (just look to the right rail), those companies and institutions that understand the value of maker culture and how important it is to foster and encourage. Finally there’s the community of Park Day School. How many of you reading this realize that the East Bay Mini Maker Faire is produced and organized entirely by the parents and staff of this progressive Oakland K-8 school? It’s a staggering accomplishment, even for a group of professionals, let alone volunteers. Thank you parents and staff! And a congratulatory tweet from MAKE and Maker Faire founder Dale Dougherty: Congrats to @EBMakerFaire team, Park Day School and @sannmer on charming “fall festival” vibe for today’s East Bay Mini Maker Faire. We’ve been collecting images and loading them into a Flickr feed. Please please share your images and videos—there were so many unique experiences at the fair that we’re just plain curious to see what you saw! Let us know via comments here, on Facebook or Twitter or G+, or email us at info@ebmakerfaire.com. So *phew* we’re done for this year. But before you forget all of this, we’ve got a survey for makers and a survey for attendees that we would so appreciate if you would take a moment to complete. Your brilliant ideas, constructive critiques, and words of adoration are all very much desired and appreciated, and will help us be bigger, better, stronger, and more fun in 2014. See you then. Photos by Stephen Jacobson, Ben Smith, John Orbon, Sabrina Merlo, Karen Marcelo and Jeffrey Braverman/MAKE. See the full Flickr gallery and attribution info here. Ed note: This story is a re-post from Makezine.com, MAKE magazine’s blog. MakerBot has a retail store in Manhattan. And UPS is testing in-store 3DPrinting services in five locations. 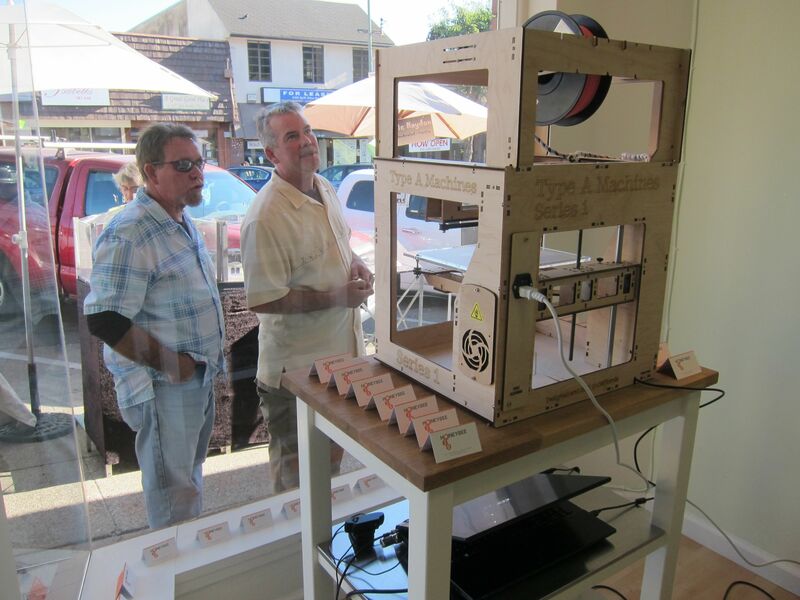 But how many neighborhoods or Main Streets have a small-biz, 3D printing/digital fabrication retail store? One that not only prints but teaches classes and sells printers? The answer is… not very many. 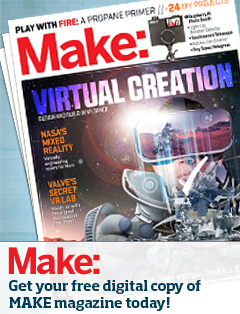 According to MAKE contributing editor, Anna Kaziunas France, there is Deezmaker in Pasadena; The Color Company and iMakr in London; =The 3D Printing Store in Denver; and the GetPrinting3D Retail Store in Evanston. And through this post we found out about iGo3D in Oldenberg, Germany. As of yesterday, HoneyBee3D in the Montclair district of Oakland, Calif. can be added to this list. Husband and wife team Liza Wallach and Nick Kloski are offering classes, printing, rapid prototyping, and they are a distributor for TypeA Machines. Liza actually has had this storefront since 2003, running her successful jewelry line and store, LizaSonia Designs, out of the space. 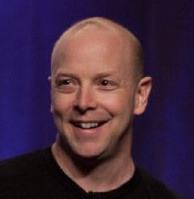 Nick is an Engilsh major who rolled into the tech industry during the dot-com boom, doing 15+ years between Sun Microsystems and Oracle. Knowing their background, It makes sense then that the two of them might have aspirations beyond the “Mayberry” of Oakland. The HoneyBee3D website says that six more retail stores are planned for 2014. The store is simple, uncluttered, and calm in feel. There are wood desks and a ceiling-mounted computer screen that can be pivoted out the display window, or inside the store for teaching purposes. When I arrived Nick was winding down a good conversation with a dad and two post-game soccer boys, and three TypeA Machines were printing away. Montclair feels like a 60s throwback main street-as-shopping-village. It’s up in the Oakland hills. It is full of small businesses and is still supporting two or three bookstores. There is frozen yogurt, coffee, dentistry, sporting goods, shoes, kitchen tools, dry cleaning. Lots and lots and lots of families, and a good number of seniors. Not “hip” in the least (the foodies and fixies are <em>not</em> in Montclair). So it’s an interesting and telling choice for a store selling 3D printers. Welcome HoneyBee3D! 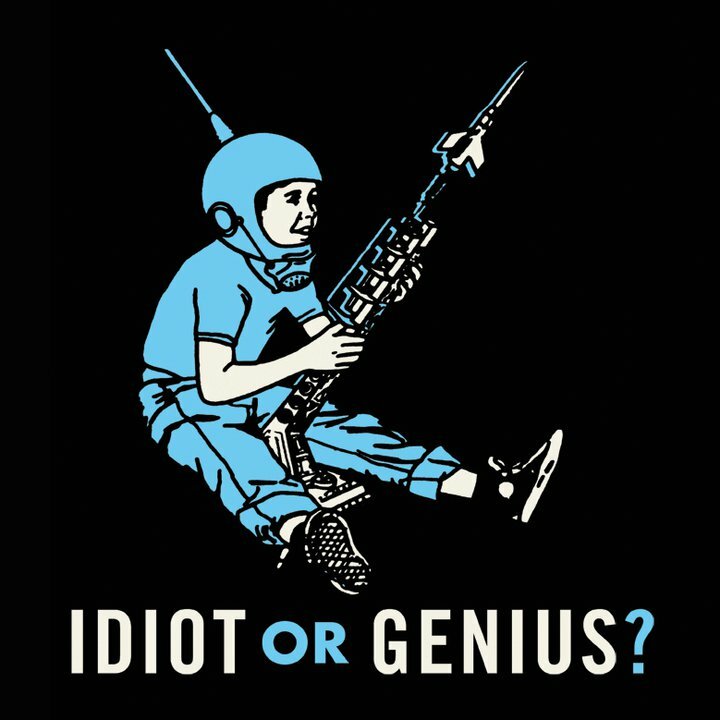 We’re very curious to know how it will go; please keep in touch! 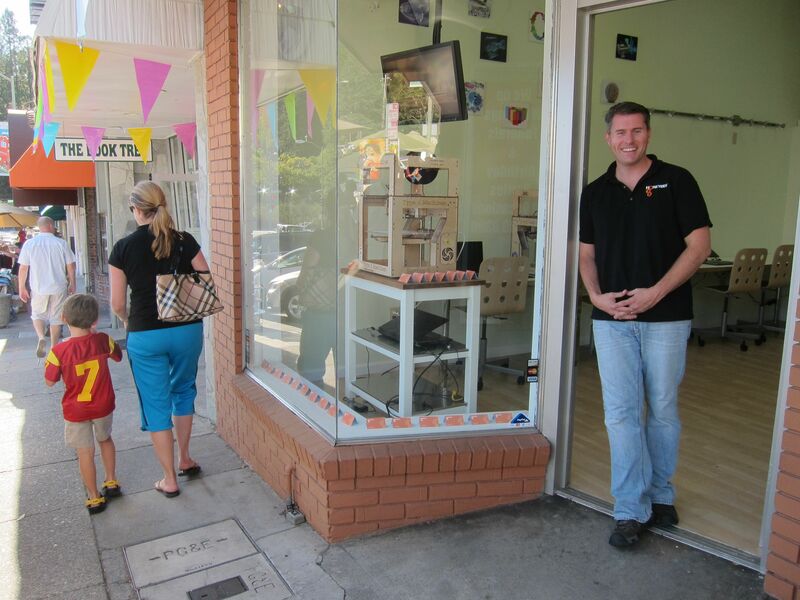 Visit with HoneyBee3D at their store in Montclair, or come meet them at the East Bay Mini Maker Faire on October 20th. For me, it’s like being a kid in a candy store— In room 1 are sewing machines all lined up in neat rows; shiny new scissors, spools of thread and heaps of fabric. Peek into room 2 and see long tables covered in crisp paper, silk screens, and brightly hued tubs of ink ready to be opened. It’s Christmas morning, first day of school, that sweet anticipation. If you like to craft you will likely spend a good chunk of your day in the Swap-O-Rama-Rama* with us. 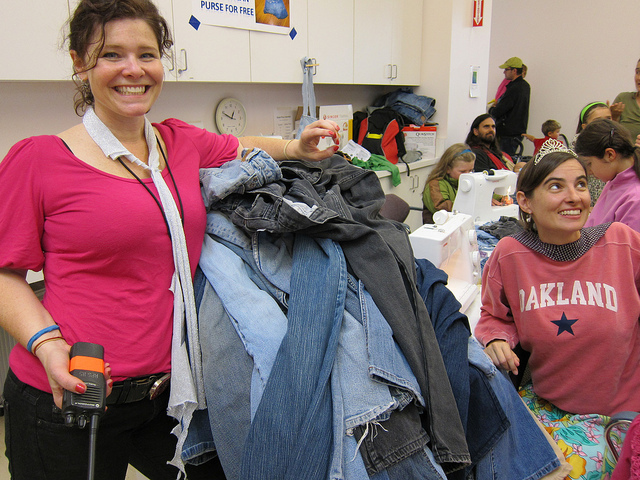 Clothing Swap—Donate your old adult or kid clothes; Come pick through our piles of available freebies—hack them, mod them, print on them, cut ‘em up and use them for some other project. This is the spirit of the Swap! ▪ Mod your T-shirt –you can make those fringed, beaded shirts all the cool kids are sporting; use scissors, fabric pens, glue on some bling, add beads and more. “Little pocket monsters” with brilliant artist Meredith MacLeod. She’ll help get you started and supervise some machine and hand-sewing monster making. Go as simple or elaborate as you want; and if you feel the need to adopt or a Monster of hers, you may be in luck. For More Sewing: We have sewing machines for you to use, with experienced sewers on hand to help troubleshoot, teach and inspire. Take full advantage. And if you want to really get your game on—stick around and maybe we’ll have a catwalk in the afternoon so you can strut in your new threads! Rock, Paper Scissors Collective If you don’t know your hometown RPS from Art Murmur or from their admirable outreach work with teens, you should. These returning artists are coming with a cool new batch of silkscreens, as well as some of their member-crafted zines, shirts and paperie to sell. Park Day Screening Zone Add some cool, original graphics to any fabric, paper or clothes you find in your visit—or even the shirt or hoodie off your back. *Swap-O-Rama-Rama by Wendy Tremayne is licensed under aCreative Commons Attribution-Noncommercial-No Derivative Works 3.0 Unported License. School just started Tuesday at Park Day, and there’s only six weeks to go to the East Bay Mini Maker Faire. So to get in the mood and generate some juice, we’ve invited author, teacher and tinkerer Gever Tulley to speak to the Park Day School’s Parent Participation Association on “The Maker Way of Learning.” The talk will be this coming Wednesday evening, September 15th, at the Park campus’s new Magnolia Building (old Matilda Brown building). I first ran into Gever 4 years or so ago when searching for some un-boring content for a parent education series I was programming for my youngest son’s preschool. Searching the internet, somehow I ran across Gever’s now infamous TED talk, “5 Dangerous Things You Should Let Your Children Do”. 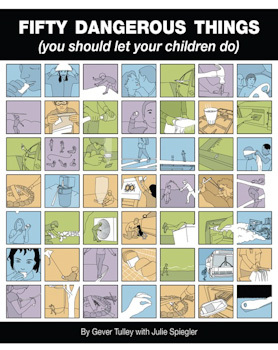 That 2007 talk has now morphed into a fabulous book, “50 Dangerous Things (You Should Let Your Children Do).” Gever explores simple things that we can do to raise our kids to be creative, confident, and in control of the environment around us. Things like letting our kids play with fire, own a pocket knife, and throw a spear. Gever is also co-founder of the Tinkering School, a sleep-away camp in San Mateo County where kids do hands-on exploration and experimentation, building and making. Gever’s spirit and approach might be summed up by his teenage babysitting rule: “If you’re going to play with fire, we have to go outside.” It took him many years to come back to that philosophy and shape it into a life’s mission, but we’re ever so glad he did — and are very happy to welcome him to Park Day School.